This loch is just north of the Bridge of Orchy and is on the southern edge of Rannoch Moor. 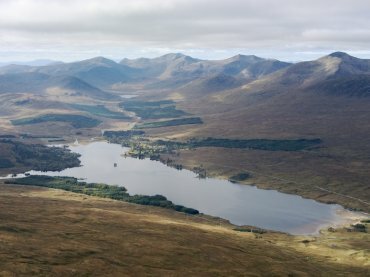 The main part of Rannoch Moor is off to the right and the road across the moor to Glen Coe can be seen just this side of Loch Tulla running along the edge of the trees. 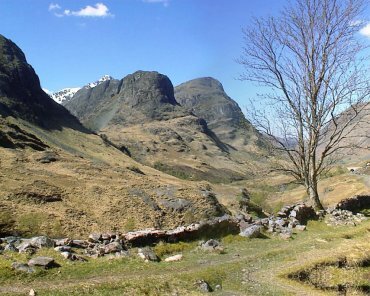 You could walk the 12 miles from Bridge of Orchy to Kingshouse at the very top of Glen Coe on the old, unsurfaced, drove road through spectacular scenery. After travelling north from the Bridge of Orchy we cross Rannoch Moor towards Glen Coe. There are no roads crossing the moor from east to west and only one road north to south and that road can be seen on the right of the picture winding it's way between the lochs. 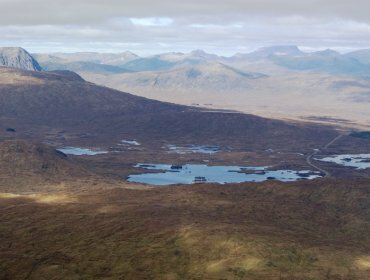 Rannoch Moor covers some 20 square miles at a height of over 1000 feet. It can look wild, desolate and foreboding in bad weather but wonderfully picturesque in good weather. 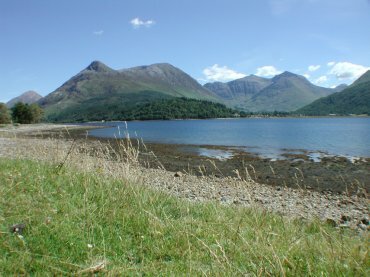 This view shows the Three Sisters on the left with the peak of Bidean nam Bian, Argyleshire's highest mountain at 3,737 feet, peeking over the top. I've climbed this peak both summer and winter and although it is not at all technically difficult you do need to watch the weather. Between the nearest two sisters is the Hidden Valley - Allt Coire Gabhail. Loch Leven lies at the foot of Glen Coe and this view is from the north side looking across to Glen Coe and Bidean nam Bian.